Mike Holloway has coached the University of Florida men’s track & field program to six NCAA Championships. He was also the sprints and relays coach for the U.S. Olympic Team in 2012. He’s seen his share of indoor tracks, but a trip to Clemson on January 7 for the Orange & Purple Classic was a new experience for the Hall of Fame coach. Elliott received similar testimonials across the board as coaches and athletes encountered the new surface for the first time. 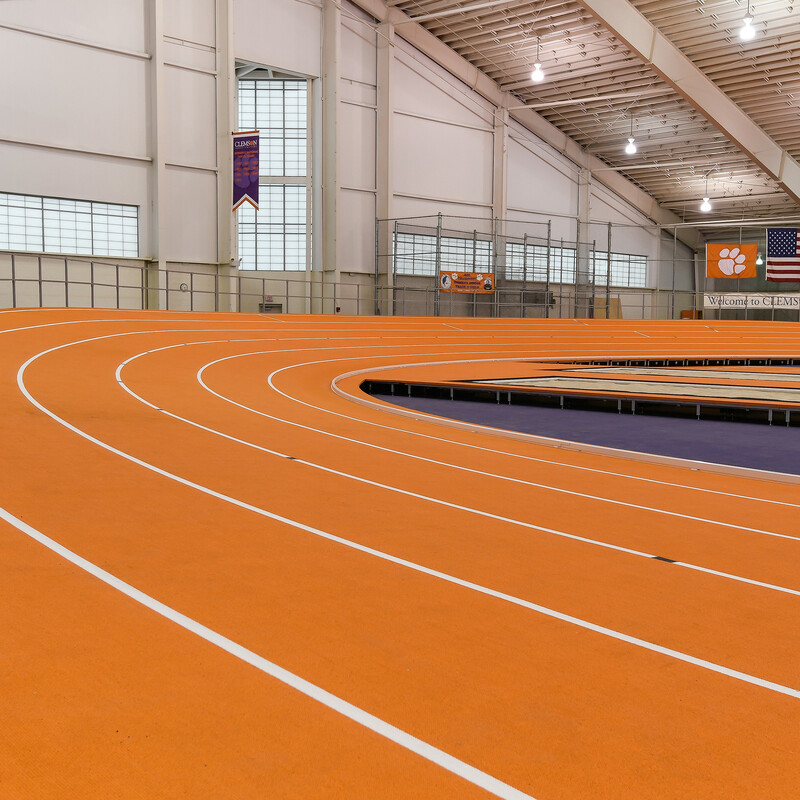 When the Clemson Indoor Track was first constructed in 2003, Mondo was the manufacturer of the surface, but it was a flat 200-meter configuration. Clemson’s new banked track was patterned after Arkansas’ Randal Tyson Center, known by and large as the fastest indoor track facility in the country. Clemson will certainly try and threaten the Razorbacks’ reputation with the fastest facility in the country this weekend, when it hosts nine nationally-ranked teams for the Tiger Paw Invitational. Alabama, Auburn, Miami, North Carolina, NC State, Notre Dame, South Carolina, Tennessee and Texas A&M are all scheduled to compete in what should prove to be one of the top indoor collegiate meets in all of 2017. “Based on the caliber of teams and athletes, we’re going to see some pretty strong performances out there,” Elliott said. “This is exactly what we wanted, not only for our kids, but for collegiate track & field. We want to be one of the places you go to record a great performance. There won’t be any restrictor plates slowing down the competition in Clemson. The action gets underway Friday with multi-events in the morning, followed by field events at 3 p.m. and track events at 3:30. Some of the top events will take place Saturday. The men’s 800 — set for 12:35 p.m. — features several of the nation’s top performers, including a formidable trio from Clemson in Terrell Jackson, John Lewis and Mpho Makofane. A newcomer from Memphis, Jackson established a Clemson freshman indoor record with a time of 1:49.28 earlier this season. Makofane owns the Tigers’ top time, a top-20 mark nationally. Elliott believes the event could be one of the most competitive of the weekend. On the women’s side, Miami star Shakima Wimbley leads a talented cast in the sprints, while the 800 could surface as a must-see event featuring the likes of Clemson sophomore Ersula Farrow, who ran an indoor-best 2:06.17 at home in January. As is customary, the meet concludes Saturday with the running of the men’s and women’s 4×400 relays, starting approximately 2:35 p.m. Texas A&M broke the collegiate indoor record earlier this season with a time of 3:02.52, and could be in position to challenge the world mark of 3:02.13. Elliott expects his team, which finished the 2016 season on a high note with a fifth-place NCAA Outdoor finish, to continue improving its times as well. Fans can expect to see plenty of big things, too. Admission is free all weekend at the Clemson Indoor Track & Field Complex.